Speaking to a group of South African chefs, foodies, retailers and representatives of the broader food industry from all over Cape Town, including the Cape Winelands, Dr Capper brought her expertise and insights to The Beefy Debate at a time when the topic is in the spotlight in South Africa. As adjunct professor of Animal Sciences in the Department of Animal Sciences at Washington State University, and as an internationally recognised livestock sustainability consultant, Chalmar Beef brought out Dr Capper as part of its commitment to provide a space in which the facts about modern beef production can be shared and robustly debated. Chalmar Beef director, Willem Wethmar, along with Dr Strydom, programme manager of the Meat Science Programme at the Institute of the Agricultural Research Council in Irene, also took part in the debate – the first of its kind in South Africa. “Every production system has its niche,” Dr Capper told the audience on Monday. Dr Capper was referring in particular to the debate around grain-fed and grass-fed cattle, which sometimes stands at the centre of issues around modern beef production. “There is certainly room for both grain-fed and grass-fed; it is often a matter of personal taste. However, if we are measuring environmental impact and sustainability, our research shows that grain-fed beef production is sustainable and will stay sustainable through continuous improvement – and that productivity is a key factor in improving sustainability,” said Dr Capper. Emphasising that sustainability is “not a race”, Dr Capper told the audience that what was important was choosing a beef production system that was compatible with the animal, feed, land and labour resources available – and this can differ between countries and climates. “It’s about the bigger picture,” she commented. Along with Wethmar, Dr Capper put the facts on the table about methods of modern beef production, including the use of growth hormones and antibiotics. “One 200-gramme steak from an implanted animal contains 5.1ng of oestrogen while one birth control pill contains 35 000ng” Dr Capper revealed. In addition, the environmental impact of grain-fed cattle raised in feedlots was discussed during The Beefy Debate. 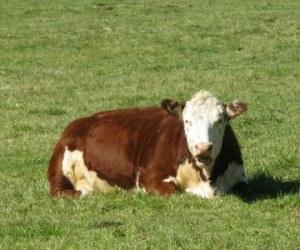 “Grain-fed beef production makes use of forages and byproducts that humans don’t eat, adding to its sustainability and efficiency,” Dr Capper concurred, adding that converting grain-fed beef to grass-fed would significantly impact the environment through the increased amount of land and water that would be required and the longer time frame it would take per head of cattle. “Beef is a safe, affordable, nutritious protein source,” concluded Dr Capper. Dr Strydom focused his talk around the quality of the beef we are eating in South Africa. The most interesting for the guests was certainly how beef is aged, the processes that make beef tender or tough, and that price and packaging is not necessarily an indication of quality and of a great eating experience. The Beefy Debate host, Chalmar Beef, is one of South Africa’s leading grain-fed beef suppliers – over the past decades becoming the first choice for many of South Africa’s leading chefs and an A-list supplier to Woolworths. Located in Bapsfontien, Chalmar Beef was started by Wimpie Wethmar in 1969. His children, Willem and Sarah, are proudly maintaining the family-based ethic that has seen Chalmar Beef gain a reputation for premium cuts of tender, juicy and flavourful beef – and win many accolades for the high animal welfare and hygiene standards of its abattoir. “The issue of modern beef production could not be more topical than right now. We agree that people should know more about what they put on their plate and know the facts and at least start the conversation. Hopefully The Beefy Debate is a starting point to get people to ask more questions about the meat they eat,” said Wethmar. After the debate, guests enjoyed a delicious Chalmar Beef gourmet steak sandwich prepared by Pete Geoff Wood of Kitchen Cowboys.